Just a few short years ago, Minto Capital Management’s move to bring in Investors Real Property Fund as a 50 per cent owner of its iconic Minto Place complex in downtown Ottawa would have raised many eyebrows. Today, however, it’s just business as normal for the company as it continues to recapitalize properties and seek new investment opportunities. 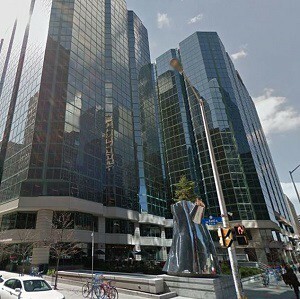 The transaction, announced Monday morning by the two companies, includes three Minto Place office towers comprising 945,030 square feet of leasable retail and office space and 1,055 parking stalls along Kent Street, Lyon Street and Laurier Avenue mere blocks from Parliament Hill. It does not include a fourth property, the multi-residential 185 Lyon St. tower, which also shares the same city block. It’s a prime site, and Minto had no trouble finding a partner for the class-A towers, which have a cross-section of tenants anchored by federal government agencies, Minto Corporate Services, Defence Construction Canada (affiliated with the Department of National Defence) and the Ontario government Workplace Safety & Insurance Board. The buildings are currently approximately 95 per cent leased. “Deals this size and quality don’t come up for grabs very often,” said Minto CEO Michael Waters. The company chose Investors from a list of several suitors. The site includes about 45,000 square feet of retail and restaurant space, as well as amenities such as a gym and pool. It’s outfitted with a green roof above the atrium level, a living wall containing more than 2,500 plants, dedicated electric vehicle charging stations, motion control lighting, e-waste collection for tenants and automated central HVAC and lighting. Minto will maintain the other 50% ownership of Minto Place and will continue to oversee property management and leasing for the complex. No financial details of the transaction were released. The buildings have all earned major certifications and/or awards. 180 Kent, built in 2009, was the first LEED platinum core and shell office tower in Canada. The Canada and Enterprise towers and the Atrium which attaches them were built in 1988, though the Atrium underwent a significant renovation in 2012. All three have been certified LEED EB Silver. 180 Kent was named BOMA Outstanding Building of the Year in 2012, and all three are either BOMA Best Gold (Canada, 180 Kent) or Platinum (Enterprise). Proceeds from this transaction, as with other recent Minto deals, will be used to expand the company’s portfolio. This strategy is central to Minto’s business plans moving forward. In fact, it’s why Waters was brought on board about five years ago to head up the once family-run company. “We’ve been in biz for 62 years. Through first 55 years of that, everything we did was on our own account. Starting about five or six years ago, we began a transformation where we began morphing into an investment manager for institutional investors,” Waters said. “This transaction that Glen and the team have put together is a further step in that direction. We’ve raised a couple of different funds in the past and we have plans to raise more investment funds in the future. In terms of future growth, Minto is looking at both acquiring existing properties, as well as developing new sites. MacMullin said despite a severe crunch for prime multi-family property on which to develop – especially in major centres – Minto is well positioned. It is currently working on three major multi-res projects, all on “excess land” beside existing properties. Minto is building an additional high-rise in Oakville, adding approximately 190 units in Toronto Leslie-York Mills and a two-tower project, also in Toronto, with a pension fund partner. A fourth project is in discussion stages. The one mitigating factor for these sites could be the Ontario government’s Bill 124 legislation, which includes rent controls in an attempt to make housing more affordable. Minto is waiting to see the final legislation before making and decisions. No matter the short-term implications, however, Waters said Minto is on track for more transactions in coming months. Investors Group is a part of IGM Financial, which manages more than $147 billion in assets and is a member of the Power Financial Corporation group of companies, one of Canada’s largest and most respected companies. Minto Capital Management Inc. is the investment management division of The Minto Group, a fully integrated real estate enterprise established in 1955 with expertise in asset management, property management, development and construction. With 1,200 employees across Canada and Florida, the company has built more than 85,000 new homes and currently manages 15,000 multi-residential units and 2.7 million square feet of commercial space. Minto Capital’s $2.9 billion portfolio is comprised of proprietary capital as well as private equity funds and joint ventures with institutional partners.